Dactylorhiza incarnata subsp. incarnata ( left) and Dactylorhiza incarnata subsp. coccinea (right) photographed at Dyfi National Nature Reserve in South Wales in mid-June. 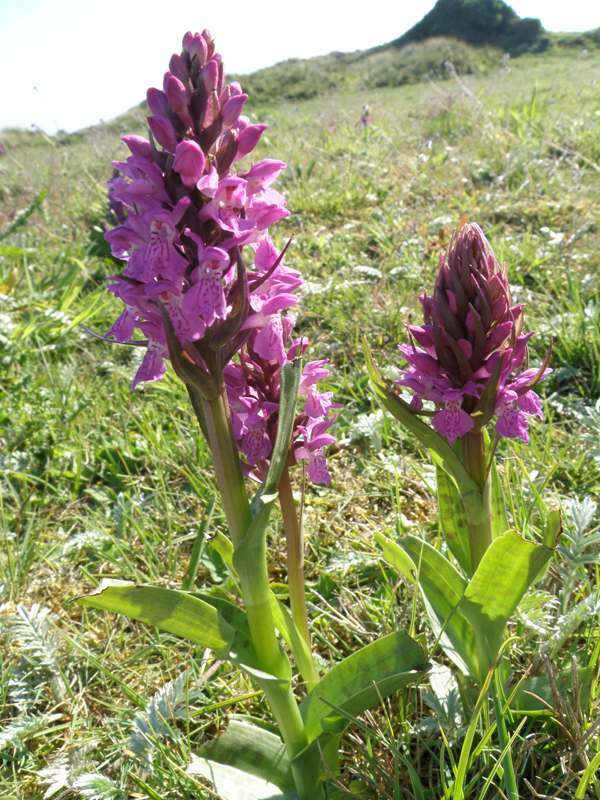 The Early Marsh-orchid is widespread throughout Britain, although increasingly marginalised due to wetland drainage and destruction of habitat for agricultural purposes. This had lead to serious decline in its former inland territories. Dactylorhiza incarnata subsp. pulchella photographed in early June. There are four subspecies (five if you include the Leopard Orchid - Dactylorhiza cruenta - although some authors treat this as a separate species due to genetic differences) of this orchid and each has a distinctive colouring. In some parts of Britain the subspecies occur in different habitats, but in Wales it is possible to see plants of at least two subspecies in close proximity in some of the extensive sand dune systems along the southern, western and northern coasts. Dactylorhiza incarnata subsp. pulchella is an acid-loving plant and knowledge of its distribution is limited due to its confusion with other similar-looking species. Particularly recommended sites include Kenfig National Nature Reserve near Port Talbot and Dyfi National Nature Reserve near Borth. Newborough Warren National Nature Reserve and the Anglesey Fens National Nature Reserves in Anglesey are also excellent places to see Dactylorhiza incarnata. All of these sites are very orchid-rich and you can expect to see many other species there too, including Northern Marsh-orchid - Dactylorhiza purpurella - (Dyfi and Anglesey), Southern Marsh-orchid - Dactylorhiza praetermissa - (Kenfig) Fragrant Orchid - Gymnadenia conopsea - Pyramidal Orchid - Anacamptis pyramidalis - Bee Orchid - Ophrys apifera - and Fly Orchid - Ophrys insectifera - (Anglesey Fens only). Kenfig National Nature Reserve is also home to the largest remaining colony in Wales of the Fen Orchid (Liparis loeselii). The Early Marsh-orchid grows to between 15 and 30 cm and grows exclusively in damp calcareous habitats which explains why it persists so well in dune systems: the ground-down seashells provide the chalk, and the dune slacks, which are submerged in rainwater during winter and early spring, retain high levels of moisture throughout the year except in the driest of springs. The leaves of the plants are unspotted. A white form of the Early Marsh-orchid photographed at Kenfig National Nature Reserve in mid-June. 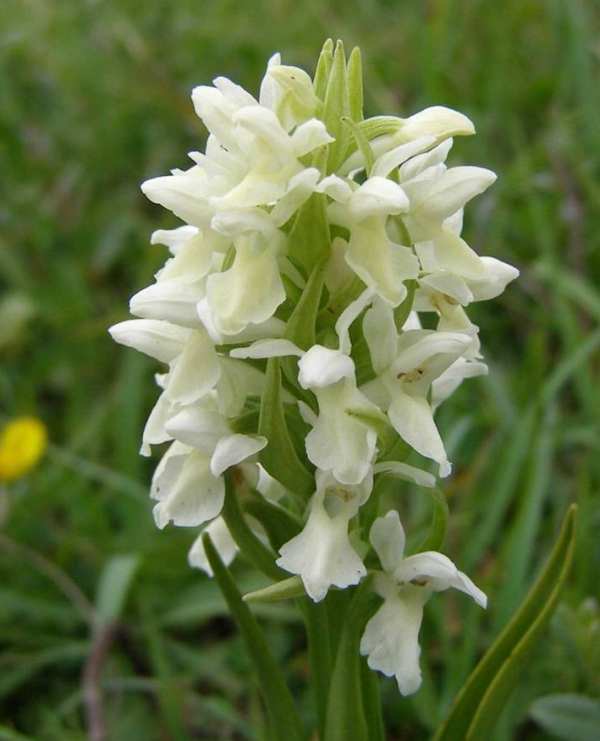 The fourth subspecies of Dactylorhiza incarnata is ochroleuca which has yellowish-cream coloured flowers. Accurate identification of this subspecies is confusing due to the occurence of white forms or varieties of Early Marsh-orchid which are possibly more common than subspecies ochroleuca. Since cautious reports of finding this subspecies in Southwest Wales have largely been dismissed, it seems that it may be confined to a few scattered sites in East Anglia. The other two white forms are described as var. leucantha and var. orchrantha. Interestingly the 'white-coloured' Early Marsh Orchids tend to be taller plants and the flower spikes are often much laxer in appearance. Although the Early Marsh-orchid is well and truly alive and well in Wales, it is extremely vulnerable to habitat change: prolonged dry weather over several seasons causes colonies to degenerate, as does the spread of rank growth of competing plants in the areas where they grow. 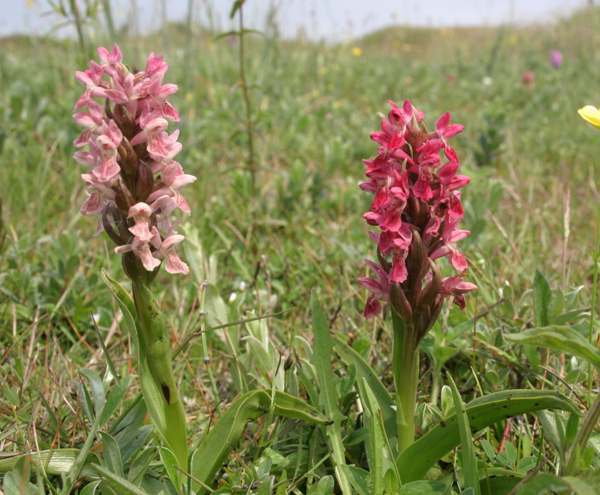 In Wales (at Kenfig National Nature Reserve) there is a programme of 'sand dune rejuvenation' being undertaken, principally to try and arrest the decline of the Fen Orchid (Liparis loeselii), but which should also benefit the Early Marsh-orchid by reducing some of the competing rank vegetation. The process involves the re-mobilisation of some of the areas of dunes which will help pioneering orchid species that need new habitat to colonise in order to survive. Outside Britain the Early Marsh-orchid is well distributed throughout Europe and into the Near East.